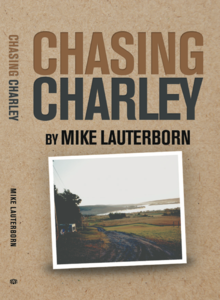 Fifteen years after returning home from a 66-day, counter-clockwise tour of the United States, Fairfield writer, photographer, and journalist Mike Lauterborn is celebrating the release of his new book, “Chasing Charley,” essentially the sequel to great American Author John Steinbeck’s 1960 “Travels with Charley” travelogue adventure. The 388-page volume, printed as a paperback with several photos and also available as an e-book, both through AuthorHouse, documents Lauterborn’s 2003 journey from his Connecticut home north to Maine, west to Washington state, south to the bottom of California, east to Florida and back north to home. In all, he traveled nearly 16,000 miles through 35 states and four provinces of Canada, using Steinbeck’s book as his road guide. His aim was to follow the author’s route as closely as possible, meet some of the same people Steinbeck met back in 1960 and supplement the voyage with some of his own agenda items. Lauterborn finished writing his book a month after he returned from his trip on Veteran’s Day, 2003, “feeling exhausted like a militiaman coming home from combat,” he described the feeling. But then life got in the way and, after some false starts to shop the manuscript, then a divorce, he abandoned the project, printing it out and resigning it to a binder to retire on a shelf. Still, though, it nipped at him. And his dad nipped at him. And his publisher nipped at him. And friends nipped at him. All urged him to see the project through to fruition. Lauterborn reeled back, wondering how she could possibly know such a thing and Bumm said, “You just confirmed that I’m supposed to be doing what I’m doing.” The very next day, Lauterborn called AuthorHouse, contracted for a production and marketing team and submitted his manuscript. A little over two weeks later, in early November, after content evaluation and a subsequent full text edit job, the book was approved to go to print. “This has been a very emotional process, from the moment I submitted my manuscript to AuthorHouse and gave them the go ahead, to reading and thoroughly editing — essentially reliving — the journey, and then getting the green light for print. It’s surreal, actually,” he said excitedly. On Thanksgiving break, he shared a first copy with his dad, Robert, to whom the book is partially dedicated. Robert is also an author, of marketing books, several of which have been translated worldwide. He always encouraged his son’s writing and instilled in him a love of words. Lauterborn’s book is also dedicated in part to his mother, Sylvia, who passed on Memorial Day in 2013, after a short battle with pancreatic cancer. In her early career, Sylvia was a stewardess with Pan American Airlines and traveled to over 80 countries ultimately in her lifetime. She instilled in her son a passion for travel. The book is also devoted to Lauterborn’s sons, Evan, 23, and, Phillip, 19 and a freshman at UConn’s Stamford, CT campus. They instilled in Lauterborn a sense of child-like wonder and are referred to frequently in the book. They were just 3 and 7 when their Dad set off around the country in his 1995 Ford E-150, 10-passenger van, piled up with clothing, books, food, camping supplies, maps and more. Evan’s class actually tracked his Dad’s progress around the country, marking up a U.S. map every time Lauterborn checked in from the road. “It was the adventure of a lifetime,” said Lauterborn. “I figured that, even if my book never saw the light of day, I would have this trip memory to savor always.” Highlights included having a drink with Steinbeck’s sister-in-law at the author’s Sag Harbor, Long Island home prior to setting off, meeting the same dairy farmer Steinbeck had in New Hampshire, fishing for salmon near a hydroelectric plant at the top of Maine with French Canadians, visiting a buffalo ranch and later dining on moosesteak at the top of a glacial mountain in Wyoming, sleeping amongst the Redwoods in California, sitting with famed Film Director Francis Ford Coppola in San Francisco, overcoming vehicle troubles and a persistent health challenge, meeting a Navajo medicine man on historical Route 66, reuniting with family in Houston then again in North Carolina, and savoring the pristine white sand beaches of Florida’s panhandle. Lauterborn came to appreciate the breadth and sheer magnitude of the trip Steinbeck — then he himself — had undertaken. And he learned much about Steinbeck and was startled by the many similarities between the author and himself with regard to family, heritage, abilities, interests and writing styles. Lauterborn also came to understand Americans better and had the rare opportunity to meet them in all their walks of life, see how they lived and understand the commonalities between us, though our accents, lifestyles and homesteads might be quite different. If you have ever dreamed of taking the great American road trip or are a fan of Steinbeck’s classic works like “Grapes of Wrath” and “Of Mice and Men”, then “Chasing Charley” is a must read. Click here to learn more about and order it.